In The Shawl by Cynthia Ozick we have the theme of conflict, control, trust, innocence and struggle. Narrated in the third person by an unnamed narrator the reader realises after reading the story that Ozick may be exploring the theme of conflict. Rosa is conflicted as she is walking towards the concentration camp. She wants to hand Magda to a stranger hoping that the stranger will look after her but she also knows that she cannot trust those on the side of the road due to their allegiance to the Nazi regime. If anything Rosa is looking for someone to show some decency while at the same time being very afraid of what might happen Magda. Later while in the concentration camp Rosa is also afraid that others will see that she has Magda wrapped up in the shawl and that Magda will be taken away from her. Leaving her to mourn Magda’s loss in an environment in whereby she is maltreated and is under constant watch by the concentration camp guards. If anything there is very little that Rosa can do as she has no control over the destiny of her life, Magda’s life or Stella’s life. She is under the complete control of the Nazi regime that is running the camp. Ozick also gives the reader an insight into the struggles that many Jewish people incurred when being marched to the concentration camps. They had no food, no shelter and no real knowledge that they may survive what was about to happen to them. Though there may have been some Jewish people who mistrusted the Nazi regime enough to be certain that death was their only fate. Knowing that they could not trust the Nazis. Things don’t improve for Rosa or Magda when they are in the concentration camp due to the fact that Stella because she is cold steals the shawl from Magda. Though some critics might suggest this to be a selfish act it might be important to consider how desperate Stella is. Though she is in the same position as everyone else. She still nonetheless has to put herself first. Just as Rosa does at the end of the story when Magda is electrocuted by the fence. Which may be the point that Ozick is attempting to make. She could be suggesting that due to each individual’s circumstance in the concentration camp. 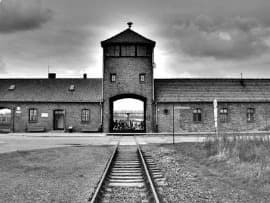 People had no recourse but to think of only themselves should they wish to survive the brutal treatment that they had to endure under the Nazi regime. One of the saddest things about the story is that Magda has no understanding of the conditions she finds herself in or the difficulties Rosa incurs in trying to keep her secret. She is after all still a young child and is unable to understand the harsh realities of what is happening. For her life may not be as difficult because she has no true understanding as to what is happening. Unlike Rosa and Stella who are acutely aware of what is occurring and what may happen to them. In many ways Magda is innocent as one would expect a child to be. Though she may be struggling to find food. She doesn’t really know what is happening or more importantly why it is happening. So distressed is Rosa by the circumstances she finds herself in that she temporarily loses her voice. Such is the degree of shock that Rosa feels. When she does partially regain her voice her first words are directed towards Magda. Which may leave some critics to suggest that despite what is happening Rosa still feels very much attached and connected to Magda. The end of the story is also interesting as Rosa knows that she cannot be seen to scream when Magda touches the electric fence and electrocutes herself. If she does she will end up facing the same fate as Magda. Something which would be difficult for any mother to have to endure. Seeing their child die in front of them but know that they can do nothing about it because of the circumstances they find themselves in. It is also interesting that just as Magda held the shawl to comfort herself. So too does Rosa when she realises that there is nothing she can do to save Magda. Magda has become an innocent victim of a regime that has killed people solely based on their religious beliefs. The reader also aware that the same fate may possibly wait for both Rosa and Stella. Though as being older than Magda they may be of some benefit to the regime. Unlike Magda who was only a child and who may not have been seen as anybody important or beneficial to the regime. Also Rosa is in dangerous position and the reader senses that she will not have the opportunity to grieve Magda’s loss. McManus, Dermot. "The Shawl by Cynthia Ozick." The Sitting Bee. The Sitting Bee, 20 Nov. 2018. Web.